St. Basil was born into a wealthy family in what is modern day Turkey. His parents were known for their piety. He has four siblings that are commonly venerated as saints; Marcrina the Younger, Naucratius, Peter of Sebaste, and Gregory of Nyssa. Shortly after his birth the family moved to the town of Neocaesarea. He was educated in his home by his father and grandmother. Following his father’s death when he was a teenager, he returned to Caesarea in Cappadocia around 350, to begin his formal education. It was here that he met Gregory of Nazianzus, who would become his lifetime friend. Together they went to study in Constantinople. Finally the two spent six years in Athens, and met a fellow student who would become the emperor “Julian the Apostate”. After traveling in Egypt and Syria, he returned to Caesarea, where he practiced law for a year and also taught rhetoric. One year later, Basil’s life would change radically after he encountered Eustathius of Sebaste, a charismatic bishop and ascetic. He soon after abandoned his legal and teaching professions in order to devote his life to God. In 362 he was ordained a deacon. He was summoned by Eusebius to his city, and was ordained Presbyter of the Church in 365. Basil and Gregory Nazianzus spent the next few years combating the Arian Heresy, which threatened to divide the region of Cappadocia. As debates started to transpire, both Gregory and Basil emerged triumphant. This confirmed to them both, that their futures lay in the Administrative side of the Church. St. Basil took the job of administration for the Diocese of Caesarea. In 370, Bishop Eusebius died and St. Basil was chosen to succeed him. He was consecrated the Bishop of Caesarea. He was both generous and sympathetic, and personally organized a soup kitchen and distributed food to the poor during a famine following a drought. He gave away his personal family inheritance to benefit the poor of his diocese. His letters also show that he actively worked to reform thieves and prostitutes. They also show that he actively worked to encourage his clergy to not be tempted with wealth, and took personal care in selecting worthy candidates for Holy Orders. He also had the courage to criticize public officials who failed in their duty of administering justice. He also preached every morning and evening, in his own church to large congregations. He suffered from Liver illness and his excessive asceticism seems to have hastened him to an early death. A lasting monument of his Episcopal care for the poor was the great institute before the gates of Caesarea, which was used as a poorhouse, a hospital, and a hospice. St. 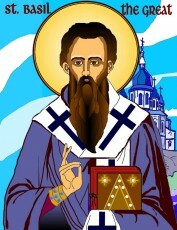 Basil the Great was the Bishop of Caesarea. He was famous for his preaching, and preached every morning and evening to large crowds in his Church. He was adamant in fighting against the Arian Heresy, and spent much of his life in teaching the faith through his preaching and defending the faith.